The first thing you learn on visiting the Sicilian city of Marsala – where the fortified wine hails from – is the phrase Before The British. There’s a clear diving line between what is legally defined today as Marsala and an older style of wine locally called “vino perpetuo”. Perpetuo is, as the name suggests, is a wine that appears to go on forever. It is kept in a barrel and topped up with new wine each year, when a quantity is removed. This is similar to the solera fractional blending system used for Sherry. 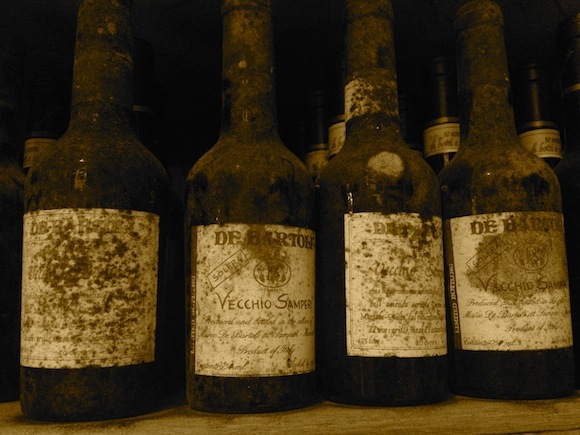 The sweet, fortified wine that most of us know was “invented” in the late 18th century. English merchant John Woodhouse, so the story goes, took shelter from a storm in Marsala, liked the perpetuo wine and wanted to take some home. To preserve the wine for the journey, he fortified it and tah dah! A rival to the highly-fashionable Madeira was created. While Marsala wine flourished as a result, fortunes have not been so kind in recent times and there is a keenness among some producers to promote the original style. Take the late Marco de Bartoli. In the late 70s, he decided to revive the traditional wine by launching Vecchio Samperi, made only from Grillo grapes. Naturally high in sugar, this white grape can reach alcohol levels in the late teens without the need for additional fortification from grape spirits. 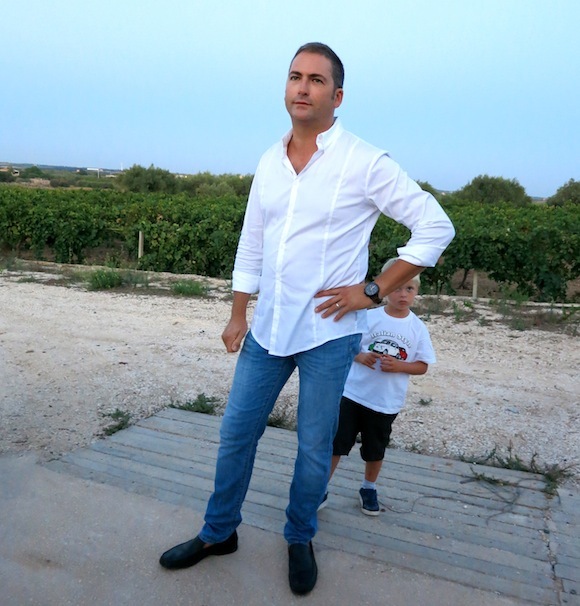 “The best ingredient to make Marsala is time,” says Marco’s son Renato, now the winemaker. 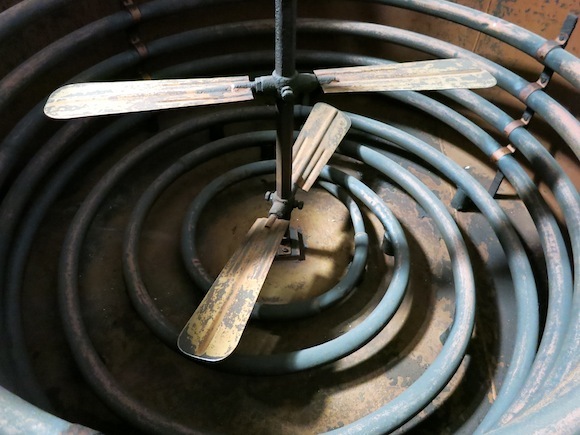 We visit the oldest room in the de Bartoli cellar. This is where the perpetuo wine is made. Barrels are piled to the roof. The grapes are vinified naturally, without any added yeasts or temperature control (as most wine is made these days). It then goes into the small barrels at the top of the stack where it is hotter. The tops of the doors in the room are left open so that the hot Sirocco and fresh Tramontana winds can sweep through, helping the wine to mature and oxidise. Every year, 5-10% of wine from the large barrels below are removed for bottling, and replaced with wine from the smaller barrels. Later, I get to drink the Vecchio Samperi Ventennale – which means the average age of the wine in bottle is 20 years. It has the savoury nuttiness of an Amontillado Sherry, but with higher acidity and a dry caramel aspect. It’s what I imagine an antique teak chest would taste like. When I try it with pork and Etna Porcini, it softens and envelops the meat and earthy mushrooms with a delicately sweet mist. To truly understand the passion for this perpetuo wine, a visit to Giacomo Ansaldi’s cellar is required. Giacomo, who owns La Divina winery and is an expert in Sicilian grapes, collects old casks of peretuo in his cellar at Baglio Donna Franca. His prize barrel dates from 1957 and he tells us how he pestered its owner for many years to buy it (“you can’t afford it” he was told). Persistence won in the end – and the fact that the son for whom the wine was created wasn’t interested in the contents. We gather round the barrel to sample and analyse what’s in our glasses. The smell reminds me of duster that’s just polished wood, but to drink is a sprightly combination of dried orange slices, walnuts and high acidity. 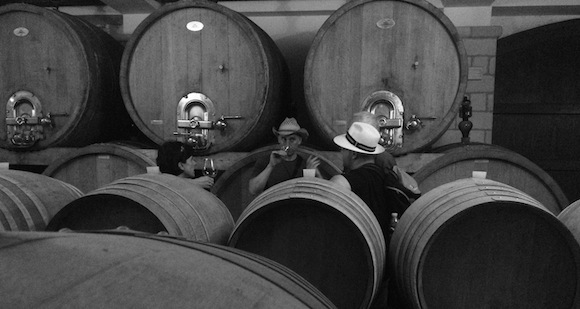 The pride over vino perpetuo doesn’t mean that producers have eschewed “proper” Marsala. 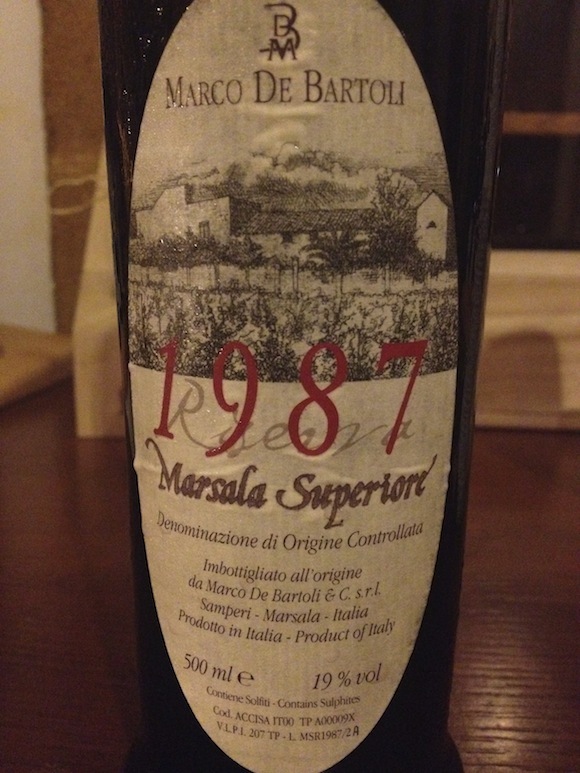 De Bartoli makes a 10-year Marsala Superiore Riserva (which turned my head in this post) and a 1987 Superiore, a superb balance of sweetness, acidity and oxidation full of energy and lift. 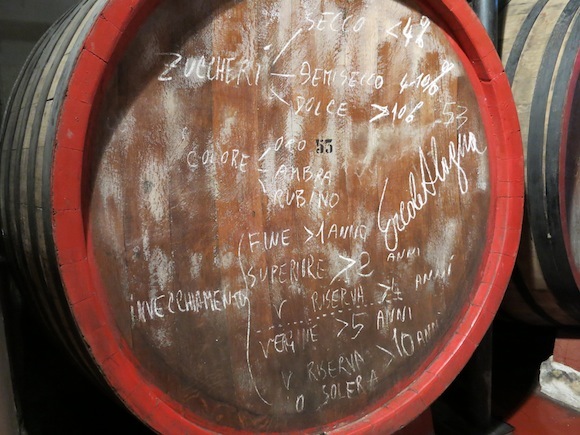 Where these differ from the perpetuo wine is that they are fortified by mixing some of the base must with grape spirit to stop fermentation before all the sugar has turned to alcohol, before ageing using the solera system. I should say here that Marsala comes in a number of different styles and it is quite confusing. First, there are three colours which come in three levels of sweetness each. Then there are various categories of cask ageing. Not all are made via the solera system. A blend of white grapes is used to two categories of colour Oro and Ambra (although the best are made from Grillo only) and red grapes – such as Perricone – are used for the Rubino. Those of us who use Marsala for cooking will be mostly familiar with the Ambra style, which is made using mosto cotto (cooked must). According the Oxford Companion to Wine “this represents a foolish attempt to create the impression of a cask-aged wine by deepening its colour with concentrate”. Some producers we met, like Renato de Bartoli, are quick to point out that they never used mosto cotto. But for Ercole Alagna, of Baglio Baiata Alagna, it’s part of tradition. Well, tradition after the British. Inside his winery, there is a large metal vat with heat filaments inside to cook the must. Alagna is capable of producing 50,000 hectolitres of wine each year (that’s several million bottles). It was started by Ercole’s grandfather and you get the impression, apart from some steel tanks, little has changed. They make quite a few different styles of Marsala, including ones flavoured with eggs, almonds and coffee – which was fashionable in more recent times but technically cannot be called Marsala anymore. The best of the bunch was the Marsala Vergine, a style which means it is aged in a cask for a minimum of five years and cannot be made with any concentrate, nor must the spirit be added with any uncooked must either. It is, if you like, the nearest to vino perpetuo. We had begun our trip to Western Sicily at the Enoteca della Strada del Vino di Marsala, where we were told that the eponymous wine has an image problem, because of its use in cooking. But there are other issues at play, especially with a market like the UK. Cost. The really good ones, and, yes, I am talking about Marco de Bartoli, lose out to more affordable Sherry and Madeira on the shop shelf. A nutty Oloroso Dulce or a tangy Verdelho, can both conjure up similar deliciously sweet, nutty, oxidative experiences. And they wipe the floor on taste when compared with cheaper Marsala. In a world where sales of fortified wines are declining – apart from Port – Marsala’s future can only ever be niche. And you can blame the British in part, for creating these markets decades ago, but not maintaining them. Fashions and tastes change. The smart producers will continue to make limited production of top notch Marsala (along with their still wines) and see restaurants as their main route to consumers, where sommeliers can hand sell a glass with cheese or dessert. That way, perhaps Marsala can be repositioned to an extent as not just a cooking wine or a piece of history, but something worth seeking out for its own merits. Marco de Bartoli wines are imported by Les Caves De Pyrene. Big thanks to Regione Siciliana – Istituto Regionale Vini e Oli, in collaboration with Fermenti Digitali / Proposta who sponsored me on this trip. Made me realize all the details I didn’t put in mine! Marsala has a big marketing issue. If I had the job of rebuilding the Marsala brand, I’m not at all certain that I would start with perpetuum or any of the quality fortified Marsalas at all. Not the way into the enthusiast market, at least not here. Trust that all is well with you and have a great holiday season. I dismissed Marsala until I was served some 10-year-old de Bartoli Reserva with blue cheese. A revelation. That’s what I meant by repositioning it in some people’s minds. People who will then seek it out as a niche experience. But while Marsala is still complicated, and a lot of ordinary stuff is on the market, it needs a lot more. Perhaps varietal labelling, like with Madeira, to separate it from the blends. Another high rate contribution to our trip in Sicily. Yes, they have a problem (or some more) in Marsala. I hope that your comments, like others from our fellows, could help some producers to steam the discussion and encourage the efforts they are trying to pursue. Nice post, Paola. As you said, it’s complicated, but you did a nice job of explaining this wine.